Based on a call for entries seeking Bay Area artists' intepretations on the theme of sustainability, ten artists were selected by students from Michael Schwager's Curatorial Practices class. The ten artists are Steven Allen, Bobette Barnes, Dillon Crossman, Art Hazelwood, Joan Hoffman, Leah Korican, Julia Nelson-Gal, Fred Vedder, Anneliese Vobis, and Megan Weirich. The exhibit is the culmination of a series of lectures and exhibits exploring the meaning of sustainability in different disciplines. 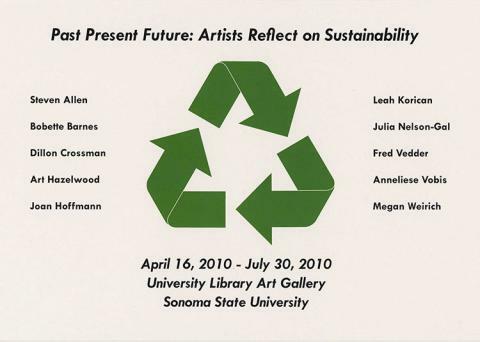 The word sustainability brings to mind numerous meanings in today's society as evidenced by the wide range of approaches of the works included in this exhibit. From ceramics and sculpture creating using found objects (including the Yellow Pages) to wall hangings and three-dimensional objects created from recycled wool sweaters, these ten artists each bring a distinctive perspective to exploring the meaning of sustainability.